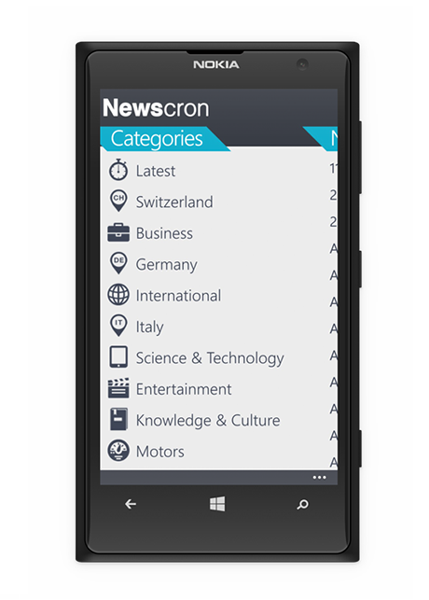 Windows Phone and Windows 8 app developed for the Swiss startup Newscron and in partnership with Microsoft Switzerland and DWB. 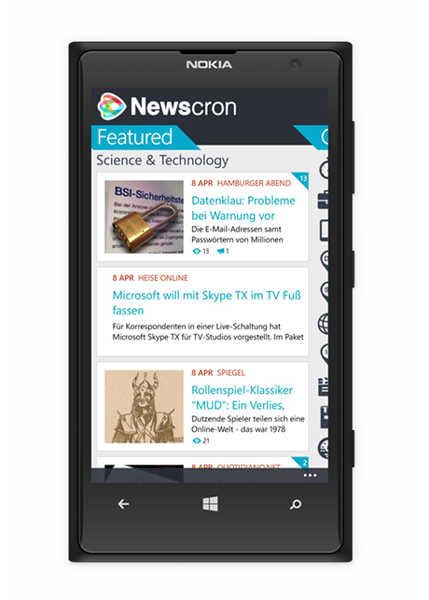 Newscron is a smart news aggregator app that filters and groups all the articles with the same subject from all the publishers into one topic, so the user will not read the same article twice. It also allows the user to fully customize the feeds, the countries and regions, languages and the frequence of categories and syncs all the preferences across devices. The most read or recommended topics. Set the frequency of the categories available in the selected package. Newspaper and publications in the selected region. The app is available in German, English, French and Italian languages. The packages containing countries and regions determine which news sources and topics are retrieved. The user has the option to create an account or to login which allows synchronizing all the preferences. 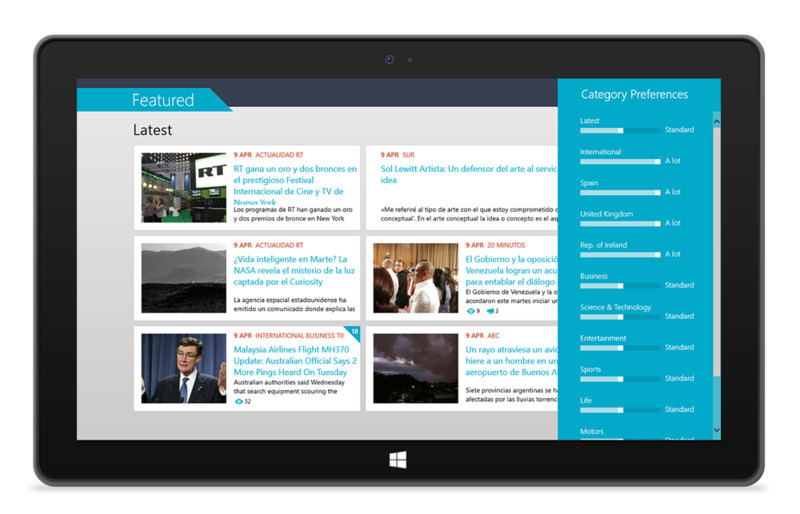 The articles are sorted by date and can belong to different news sources from different countries. 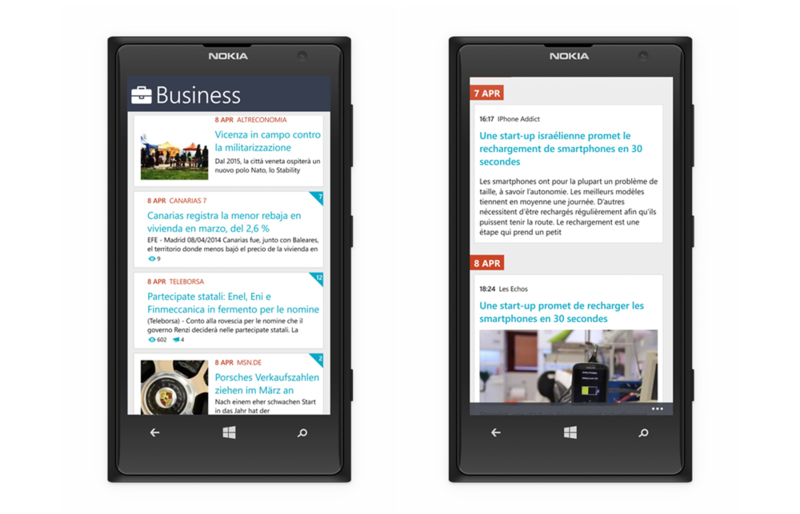 The two screenshots show different content languages: topics from the Business category from Germany, France, Spain. ”We love working together with Oana and Arthur from Cobalt Sign especially for Windows Phone and Windows 8 platforms. They are highly skilled experts for those platforms and combine great UX design and coding skills.